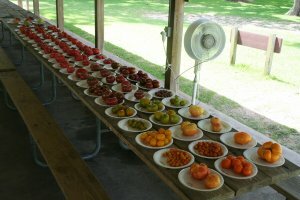 The South East Texas Tomato Festival (SETTFest) was an open-to-the-public informal tomato tasting and enthusiast gathering of folks from Austin,San Antonio, Dallas, Houston, and surrounding areas. It was held in 2007-2011 at various state parks in S.E. and Central Texas. A not-for-profit event, the tasting attracted a growing crowd of aspiring home gardeners and commercial growers alike with an interest in growing tomatoes for flavor rather than traditional market appeal. 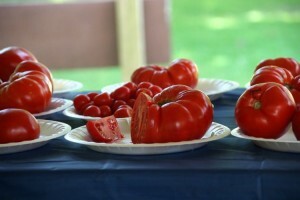 SETTFest was first-and-foremost a tomato tasting, not a competition, and there were no rules other than a request that each variety be labeled as accurately as possible. 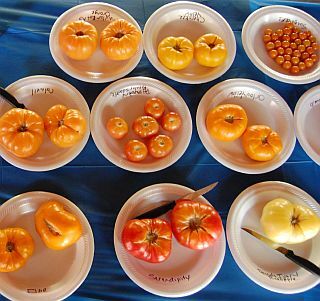 It was an opportunity to for those with a common interest to experience unfamiliar tomato varieties, some of which have been grown for over 100 years but forgotten by seed companies. Tomatoes come in all shapes and sizes — they are not all red, round, and flawless in appearance. We believed that gardeners in S.E. Texas should feel free to grow a wide selection of tomato varieties until they found choices with great flavor, productivity, and other characteristics that they were looking for. We found through trial-and-error that there was no need to limit one’s self to varieties recommended by state and agriculture bodies. 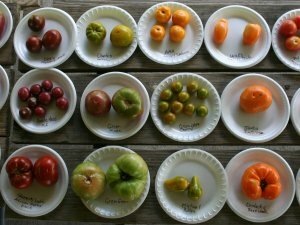 Over time, this website became a resource for tomato growers in South East and Central Texas to challenge some of the myths about gardening in the state. 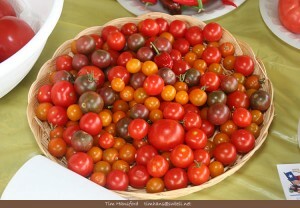 The SETTFest tasting event was heavily inspired by other regional tomato gatherings and tastings including but not limited to CHOPTAG, Tomatopalooza, NORCATT, DATE, and MAGTAG. Sausage and brisket from Gonzales Food Mkt, tomato casserole and other covered dishes, breads, cheeses, chips and dips. Breads, cheeses, chips and dip, Greek pasta salad, cucumbers, homemade hot chile powders. Breads, cheeses, Greek pasta salad, cucumbers, homemade hot chile powders. A pasta salad consisting of feta cheese, olives, bowtie pasta, and tomatoes was served at the close of the event. A selection of cheeses was also available. Cucumbers, peppers, herbs, homemade cold-pressed olive oil, mustards, fruit preserves, bread, pickled peppers, pasta salad, and desserts were all available.